In my experience in the client services business, I have trained a lot of managers who are responsible for leading both internal teams and external client contacts. One of the most important and useful tips I’ve given is to be like a duck on the water – even when you’re going mad trying to handle multiple demands, requests and needs, look calm. Lead with confident assertiveness – even when you’re unsure. It’s vital to make your team – both the one you manage and the one you service – believe that you’ve got it all under control. Be a duck on water – it’s fine to paddle furiously underneath, but look calm, graceful and in control above the surface. You’ll be surprised at how well this technique can help you become a better leader. This entry was posted in Business and tagged business, leadership skills, management tips on September 3, 2013 by Christine. “I heard a lot more about creating the right environment for business,” – yes, but when will we see the how – the execution – the reality? Now *that* would be revolutionary and innovative. What did you think? What would you have liked to hear more about from Obama? President Barack Obama made some concessions to the business community in his State of the Union address Tuesday, saying he’d like to lower the corporate tax rate and foster U.S. job growth and innovation. Many CEOs reacted with skepticism as to the President’s ability to deliver on these areas, but noted positively the President’s changed tone in addressing the business community. 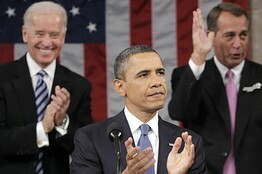 President Obama was applauded by Vice President Joe Biden and House Speaker John Boehner prior to delivering his State of the Union address. While CEOs welcomed the idea of lowering the corporate tax rate, many were unclear on how Mr. Obama would do so given the sparse details. “He said it would pretty much have to be budget neutral and I don’t know how they can reconcile that,” says Alan Miller, CEO of Universal Health Systems, a hospital management company. Mr. Miller says he’d be more encouraged had the president specified a new, lower rate. “A lot of things he says don’t ever come to pass,” he says. “I thought it was a wonderful idea but there’s no free lunch,” says John Chen, CEO of Sybase Inc., a Dublin, Calif.-based software developer bought by SAP in July. Mr. Chen says the measure will depend on what Mr. Obama meant when referring to “corporate tax loopholes.” Anthony Guzzi, CEO of Emcor Group Inc., a construction and facilities service provider, also says he’d like to see Mr. Obama provide more details on lowering the corporate tax rate. “He gave a sound bite but should have been more specific,” he says. “For two and a half years now, capital has been afraid to invest in the U.S. in any substantial way,” he says. CEOs did note a change in tone during Tuesday’s address, after years of Mr. Obama being criticized for being anti-business. “I heard a lot more about creating the right environment for business,” says Eric Spiegel, CEO of Siemens USA. “I think he got the message that business is where jobs will be created, not the government.” Mr. Guzzi said Mr. Obama was “more moderate” in his address. Marc Benioff, chief executive of San Francisco business-software company Salesforce.com Inc., says he was encouraged by Mr. Obama’s call for increased government spending on basic research. “The number one thing the government needs to do is increase its research funding …This is where the government adds tremendous value,” Mr. Benioff says, adding that his company is based on technology—the Internet—that was spurred by research commissioned by the U.S. government in the 1960s. Greater spending on research “is critical for us in every area, in cyber-security, in computational sciences, even in health information technologies,” he says. Greg Babe, CEO of Bayer North America, was encouraged by President Obama’s mentions of innovation. Bayer’s North American operations spent $700 million on research and development in 2010, and Mr. Babe says the yearly uncertainty on whether R&D tax credits will be renewed is a stress to the company. Mr. Obama didn’t specifically mention these credits. Mr. Babe says he would have liked President Obama to speak more on free trade. “A lot of other free trade agreements are in the queue waiting for [Korea] to move,” he says. Mr. Babe says the lack of agreements negatively affects the company’s business globally. Bausch & Lomb’s Mr. Saunders said President Obama’s focus on innovation resonated with him, as well. The contact lens and solutions maker has been working to innovate products for customers in Brazil, India and China, but Mr. Saunders says the industry is highly regulated. Mr. Saunders says he’d like to see the government “support and nurture” innovation. “Now, we’re somewhere in between letting companies fed for themselves and creating barriers for free trade,” he says. The president did not mention free trade or suggest he would give corporations a tax holiday on earnings outside the U.S., two major issues for business leaders over the last two years. Mr. Obama has been criticized for not enacting free trade agreements during his term, limiting the amount of business U.S. corporations can do with other countries. Mr. Chen said he would have liked to see the U.S.’s export policy brought up during the address. He says because of “outdated” restrictions to exporting certain technology, Sybase’s ability to sell into China has been restricted. Mr. Obama mentioned improving business conditions in the U.S. and increasing competitiveness by eliminating unnecessary burdens. Mr. Spiegel says a burden Siemens faces is regulatory red tape that delays projects. For example, he says the company was just recently awarded a contract for an offshore wind project that has been in the works for years. “A lot of the regulations in the U.S. are very burdensome,” he says. This entry was posted in Business, Uncategorized and tagged barack obama, business, corporate, Government, president, president obama, sotu, state of the union on January 26, 2011 by Christine.